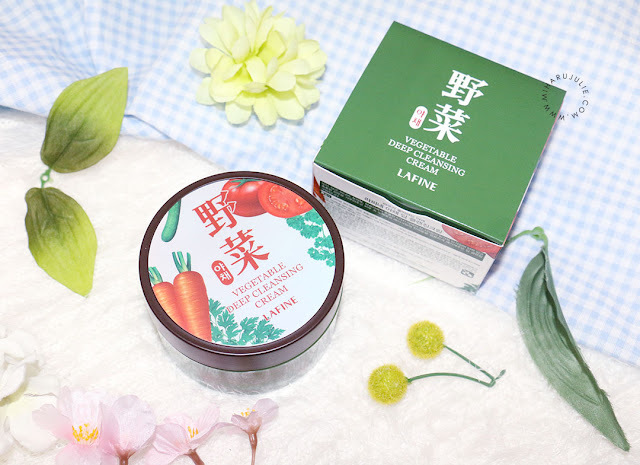 I received the Lafine Vegetable Deep Cleansing Cream in BNTgirls October box. The Lafine Vegetable Deep Cleansing Cream is from the brand Lamy Cosmetics, which is a Korean brand. We all know that vegetables are good for our health, but what about for our skin? 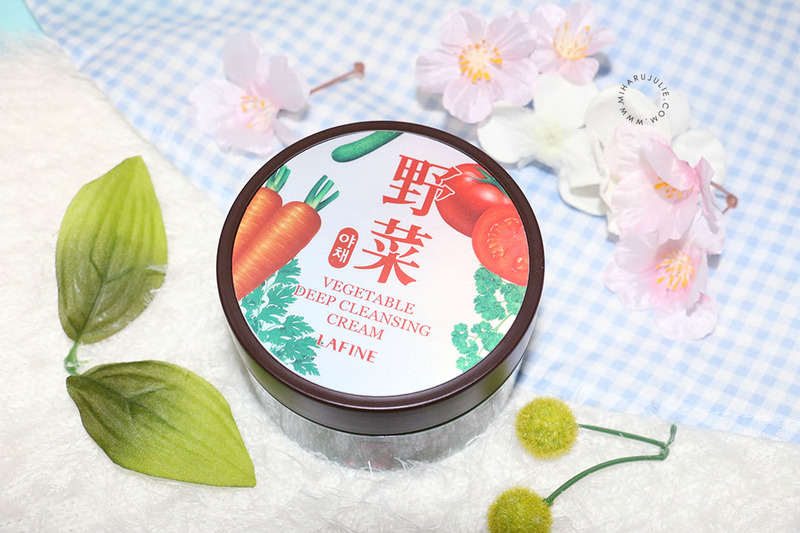 The Lafine Vegetable Deep Cleansing Cream is meant to remove makeup and dirt that are present on the surface of the skin. 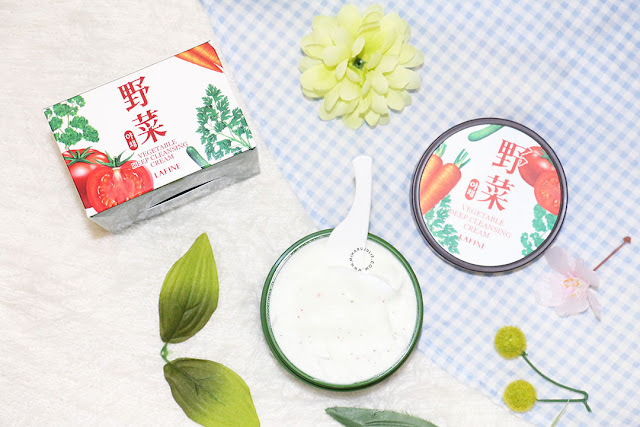 As the name of the product suggests, this cleansing cream is made from vegetables such as parsley, carrot, cucumber, tomato and water parsley. It suits all skin type, and is really gentle on the skin. The box is really pretty it has pictures of parsley, cucumber, tomatoes and green colour writings. The box main colour is green. The jar of cleansing cream is also green with beautiful picture of vegetables. 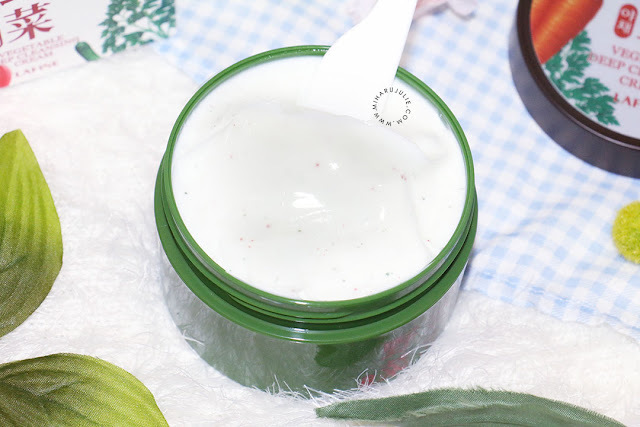 Gently massage your face with the cream until the green and red granules completely melts. The Lafine Vegetable Deep Cleansing Cream has a white color and contains small green and red colored grains. 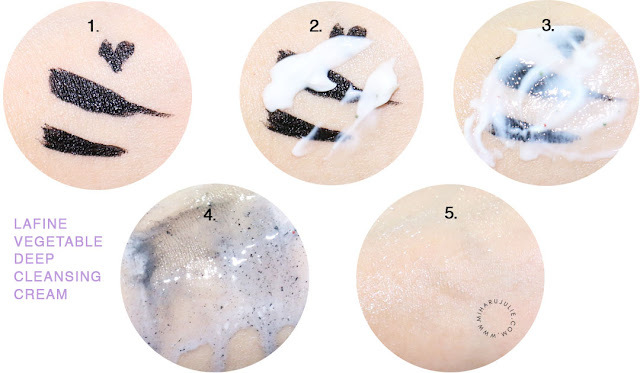 These granules disolve while massaging the cream on your skin. The consistency is a thick-ish cream almost like a body lotion and the ability of cleansing oil. So, gentler than soap and lighter than cleansing balm. As usual, I tested the cleaning power of this product by first tarting up the back of my hand with a layer of waterproof eyeliner and sunscreen. 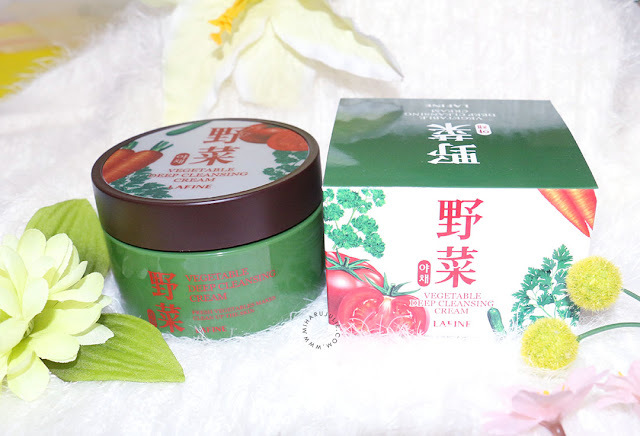 I then scooped out some Lafine Vegetable Deep Cleansing Cream and put it on my hand. As you can see, it’s easy to tell when the product has done its job. 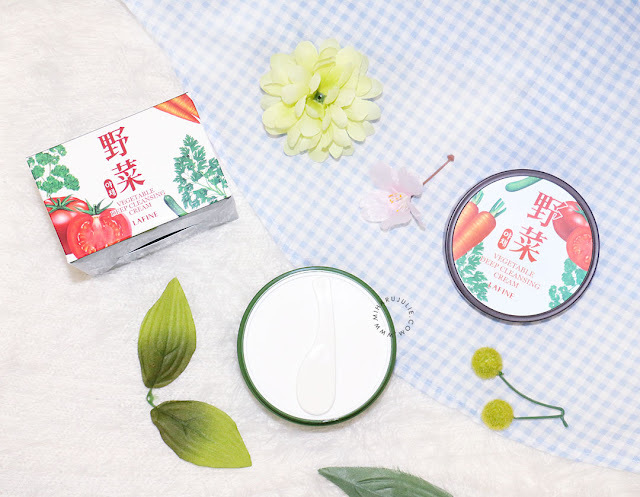 The cleansing performance of the Lafine Vegetable Deep Cleansing Cream is good, my skin felt fresh and clean. 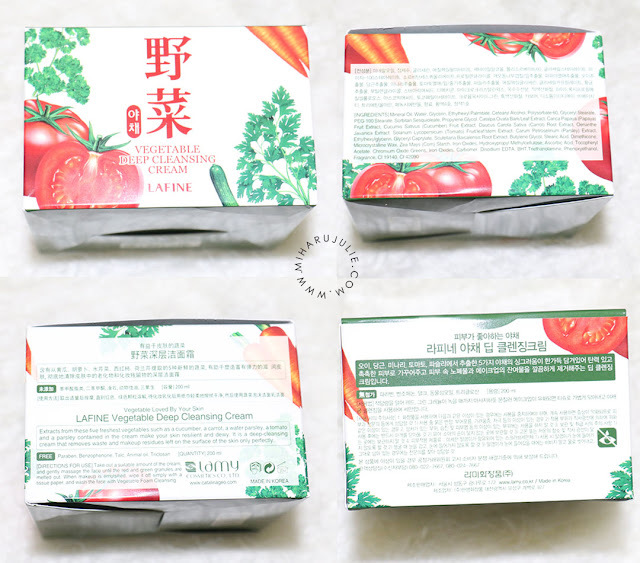 The moisturizing ingredients help to keep my face from feeling stripped. 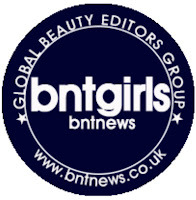 For people with very dry or dehydrated skin, even oil cleansers can be stripping, making double cleansing a challenge. I think the Lafine Vegetable Deep Cleansing Cream could be helpful for such situations. Using the Smooth Cleansing Cream as a first cleanser and following up with a foaming second cleanser also eliminates residue concerns for those who don’t want their first cleanser to stick around. 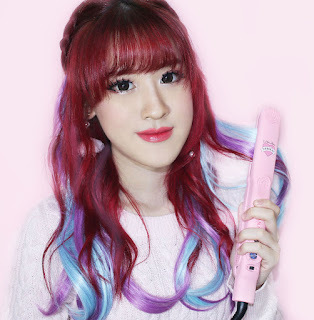 Ini produk cleansing untuk dry skin aja ya Miharu Julie?